Why you need a standing desk??? A study published on PLOS One found that when you stand you will burns more calories and involves more muscular contraction than sitting. It is necessary to improve blood sugar profiles and vascular health, reducing the risk of premature death. 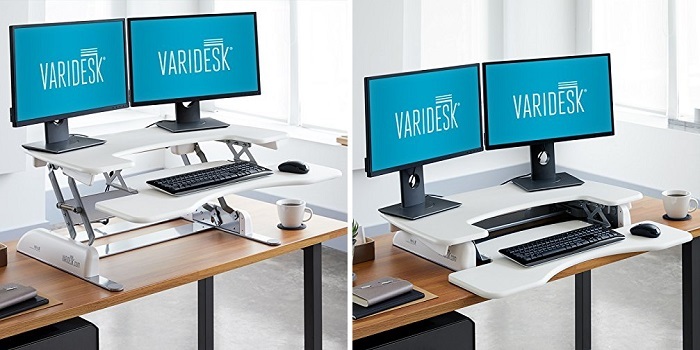 Not only help you to be healthier, a study published in Centers for Disease Control and Prevention (CDC) also found that sit-stand workstations also help to improve your mood in a positive state. Positive mood will make your mind clearer, helping you to handle a heavier workload well with less stress. Similar study conducted by Draugiem Group (a start-up incubator in Latvia) found that "standing workstation users enjoy 10% higher productivity". 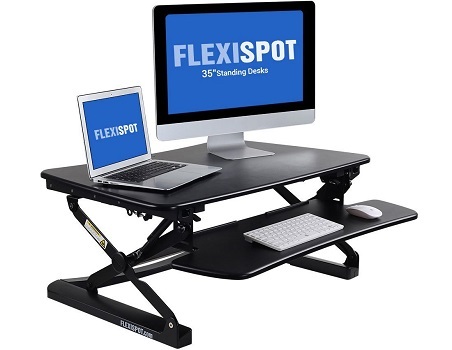 Not only for employees, standing work desk also give huge benefits for business owner with lower sick leave, higher productivity and creativity among employees. 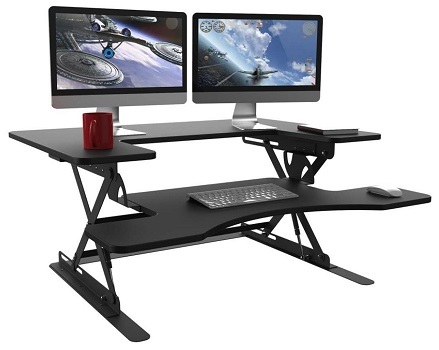 • Fixed - doesn`t require a separate desk but there is nothing you can do to adjust the height. • Converters - a cheaper option to converts the desk you already own easily. 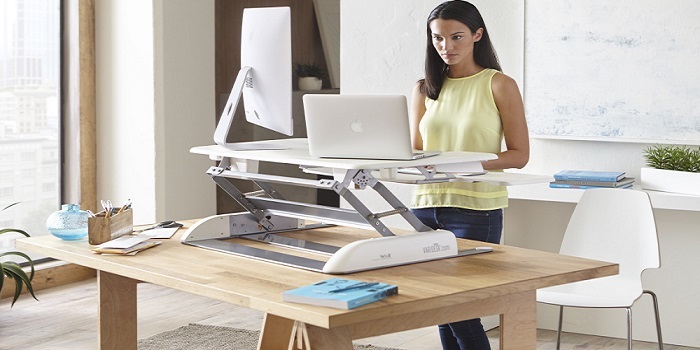 • Treadmill desks - allow you to stand and walk while working. • Manual or Hand Cranks – offer zero operation costs but if the objects on the desk is arranged in a way where one side is heavier than the other then it will be hard for this manual system to handle the weight discrepancy and keeping the desktop perfectly horizontal. 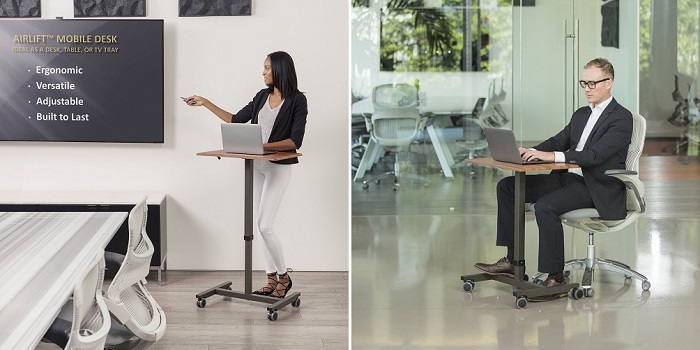 • Electric – simply with push of a button, you are able to adjust the desk to your desirable height. • Counterbalance or balanced mechanical system – press the release lever and then manually move the desk to your desired height. This system work silently. Wires and clutter must can be neatly hidden away from sight. Also make sure the desk have enough power outlets. • Aluminum frames are more sustainable and lighter than steel. • Monitor arm to hold your monitor. • Keyboard trays for proper ergonomics and save desk space. Seville Classics is designed to provide ergonomic comfort. It comes with beveled edges that serve as a wrist-rest when computing or writing by hand. 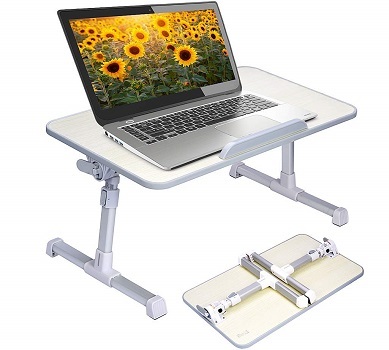 You can effortlessly adjust the height of the desk with the Airlift height-adjustment lever in seconds. • Good welding and paint job. • Sturdy desktop & stand. • Easy to adjust & move around. 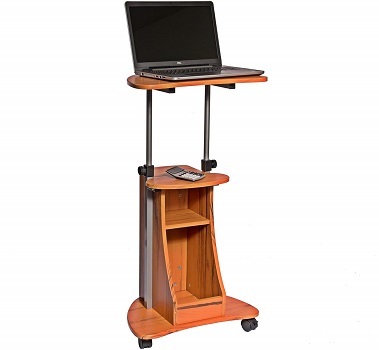 • Easily roll the desk cart to any room. • The top can come off to be rotated 180 degrees to give the top about a 35 degree tilt. • Not designed for a bed due to center post. • No area for storage of other media and items. Avantree is a multifunctional laptop workstation that can be used as a standing desk, a TV tray for snacking, or a smart book stand that accommodates any sitting position. Perfect for 15'' laptops with a mouse or 17" laptops without a mouse. • Well built, quite sturdy. • Fits modern decor perfectly. • Great size for a laptop or writing. • Easily folds flat into a fairly thin size. • A bit slicky surface. • No cooling fans or drawers. 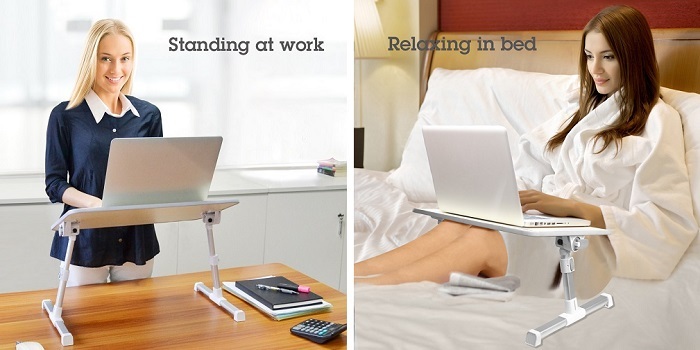 • MULTIPURPOSE - It acts as a multifunctional laptop workstation, a standing desk for office work, a TV tray for snacking, a laptop bed stand for relaxing in bed or a book/tablet stand. • HEALTHIER WORKING - When used in conjunction with a regular desk it enables you to work while standing; freeing yourself from disorders such as backache, and spondylitis caused by long hours sitting in the workplace. • EASY TO USE - Two auto-lock buttons on each side easily enable quick changes in height (adjustable from 9.4"-12.6") in addition two clamps may be used to adjust the surface angle (from 0-30°). • LIGHT BUT STURDY - It can fold flat for convenient storage, is light enough to carry around, made of 100% high quality engineered wood which is environmentally friendly, strong and durable. 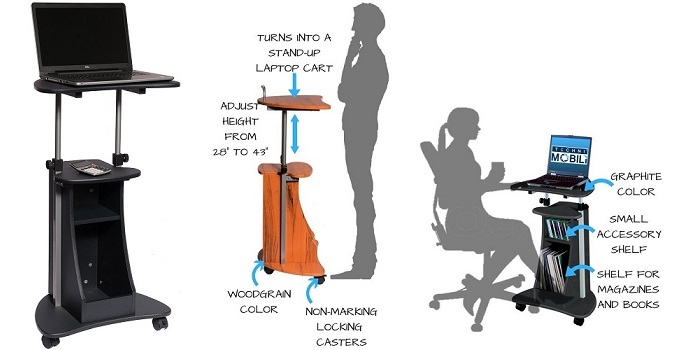 • PORTABLE - You can work anywhere, simply fold the desk and you have your own ergonomic workstation ready. 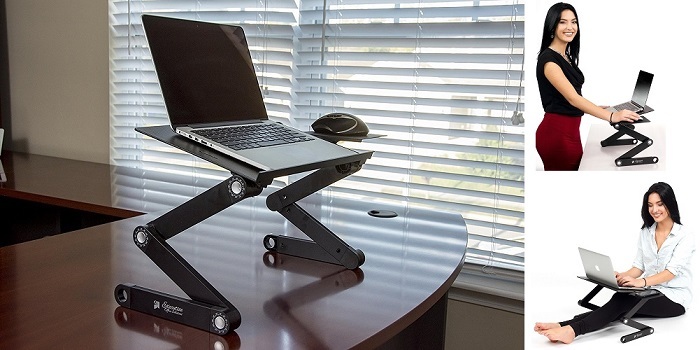 Executive Office Solutions is a multifunction laptop stand that can be used on the desk, couch, bed, or as a standing desk. The space between the Legs allows for books or other things to be placed below. • Easy to install & very portable. • The legs are a bit wobbly. • The stoppers kept sliding off the pad. 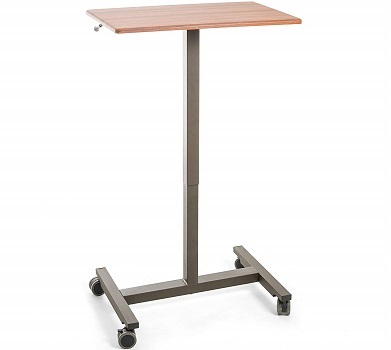 • Fully adjustable legs – rotate 360 degrees and lock in place at various angles. Quickly collapse the stand to make it portable. • Miltiple uses – also can be used for a TV dinner tray, sound equipment, projector, standing desk, book tray, writing desk, and tablet holder. • Includes non-slip feet for use on tabletops and desktops. • Silent USB powered CPU cooling fans – connect USB cord (included) to your computer to power the quiet cooling fans. 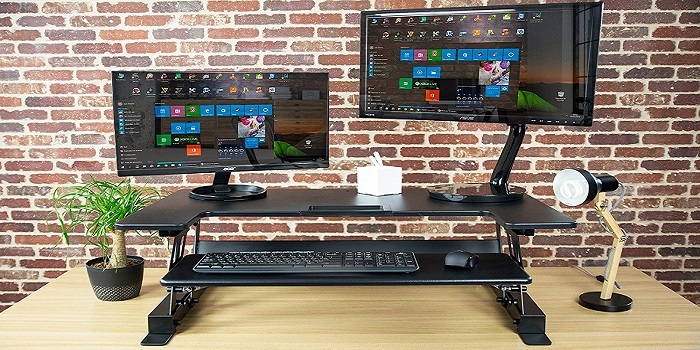 Comes with two-tier design to give you a spacious upper display area for a dual-monitor setup, while the lower deck has plenty of room for a full-sized keyboard and mouse. 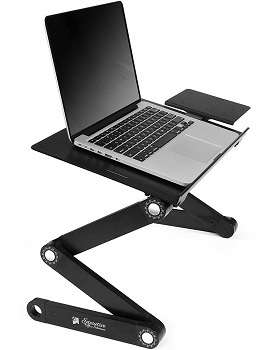 It`s super easy to lift and hold up to 35lbs, lower, and adjust to any of the 11 height settings. • Too many wired peripherals. • Comes fully assembled right out of the box - no assembly, installation, or tools required! Halter ED-258 was designed to assist those of you who are suffer with back, neck, posture, and circulation problems. 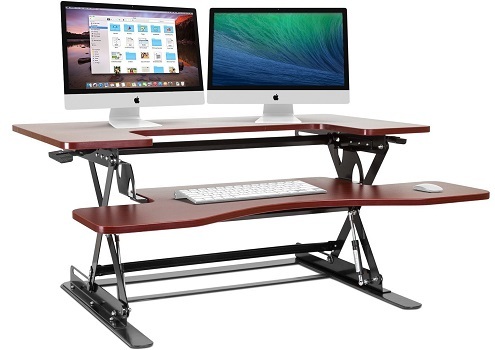 Its multiple height desktop work levels to maximize comfort, optimize posture, natural blood circulation, and reduce eye strain. • The handles are easy to release. • Movements up and down are extremely smooth. • Raises minimum keyboard height. 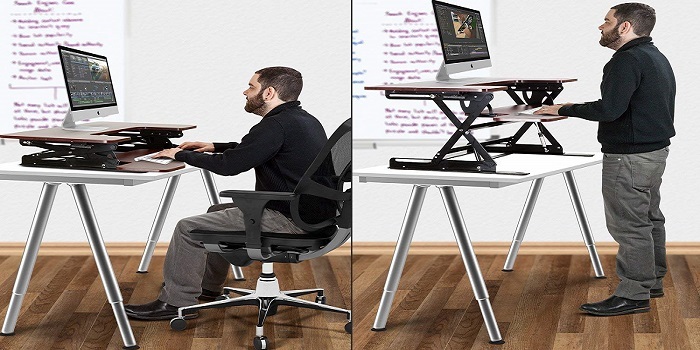 VIVO DESK-V000B sits on top of your current desk and gives you the benefit of standing or sitting on demand. 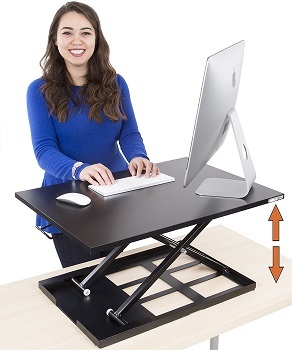 The top platform rests 6.5" from your desk’s surface in sitting position and 16" when at maximum height. It comes with steel frame combined with innovative gas spring power that holds weights up to 37.5 pounds. • Good stability at all heights. • Grommet mount on monitor platform. You can easily adjust the table height between 28 and 43 inches with dual adjustment knobs to comfortably fit your height and the task at hand. It also comes with open storage compartment ideal for media storage. • Everything lined up perfectly. • Neat little top bar is a nice backstop. • No particular strength or tools needed. • Veneer is like thin plastic. 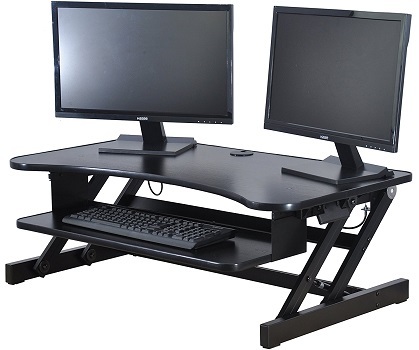 The X-Elite Pro sit stand workstation fits on top of your existing desk, arrives fully assembled. 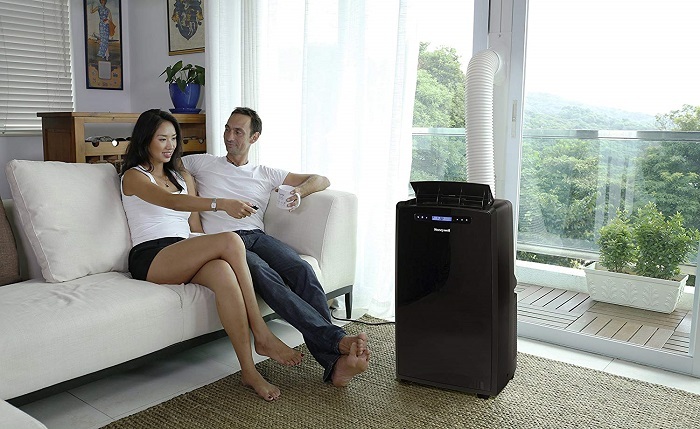 It comes with innovative air pump system allows you to switch between sitting and standing in 3 seconds, allowing you to sit or stand without any interruptions. • Easy to store in closet or under desk. • Single flat surface for ergonomic comfort and increased productivity! FlexiSpot M2B offer a deep work surface, a wide keyboard, and instant tablet integration. 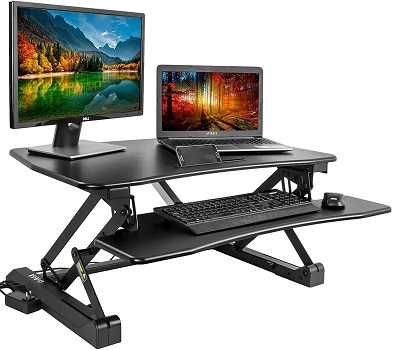 It moves up/down smoothly with twelve height adjustment settings and ergonomic monitor mount compatibility. • Rises and lowers with one hand. • It adjusts very fluidly without strain. • Smooth and stable dual gas spring motion. • Quality construction; fatigue tested 6,000 time. • Has a slot to hold a cell phone or tablet in an upright position. • The keyboard doesn’t tilt. • Slippery surface of the keyboard and tabletop. 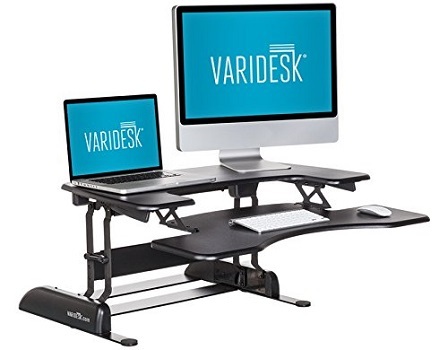 Comes with 37-1/4" wide x 20-1/2" deep work surface accommodates two monitors setup and ergonomic keyboard tray that moves up and down with the desk and moves out/in for the most comfortable position. 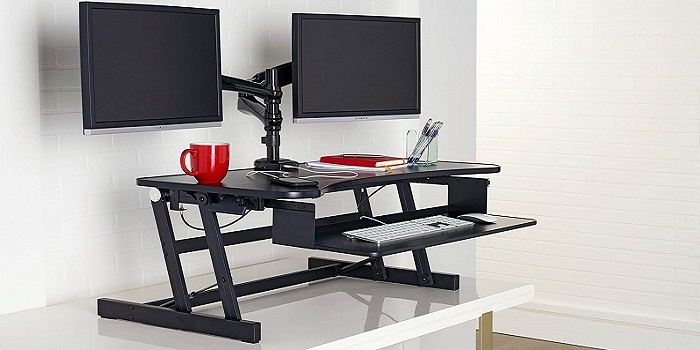 Gas spring will allow you to easily move the desk up and down, even with your computer equipment. 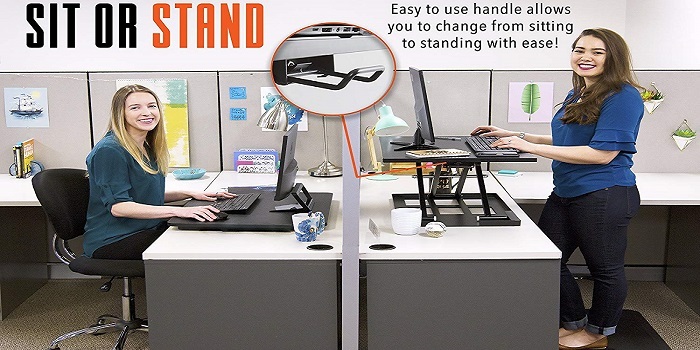 • The key board tray is not high enough in the standing position.